It has been a really busy couple of weeks for Azure and distributed ledger technologies! See what we’ve been up to below. MultiChain: Rapidly design, deploy and operate distributed ledgers. Check out the MultiChain on Ubuntu documentation page for more information. Netki: Designs enterprise-grade solutions promoting scalability, security and ease of use for Blockchain-based products. The Netki Wallet Name Service is an open standard that makes it easy to send digital currency between users or services, interconnecting the entire ecosystem. WNS is designed to allow service providers to easily register Wallet Names on their client’s behalf, such as “username.company.com,” or for end users to register their own vanity names such as “personalname.me” linking them directly to a wallet address. View a template here. Emercoin: A leading digital currency and Blockchain platform focusing on innovative, scalable enterprise services. The Emercoin Blockchain will offer Azure clients solutions for network security, eCommerce, advertising, business contacts, ownership and identity management. Eris: Eris is a universal blockchain platform capable of running any client for a public blockchain and any client for a permissioned blockchain which is open sourced. The Eris platform greatly reduces the complexity of creating blockchain based applications. Integrate multiple blockchain, distributed file storage, and other distributed systems into a cohesive application. Eris also makes it simple and easy for your organization to get started using permissionable, smart contract capable blockchains. Learn more about the Eris Platform Node. CoinPrism: Now deploys the version 0.5 of OpenChain which we released early January, and supports high availability, disaster recovery and business continuity through a new Microsoft SQL Server storage backend. Check out the template here. BitPay: Bitcore, a complete set of Bitcoin utilities for CentOS, Red Hat Enterprise Linux and Fedora Linux. Also a full Bitcoin node that’s 100% compatible with the Bitcoin core code base and comprehensive Node.js language libraries for extension of the core Bitcoin functionality. Test the complete set of Bitcoin utilities with this template. 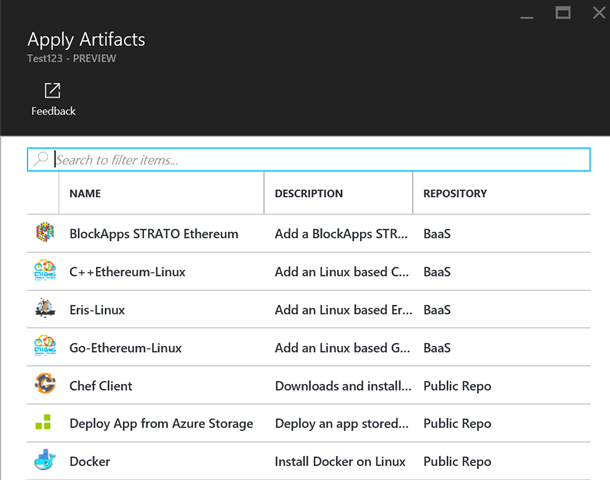 Blockchain technologies will become even easier to build and test using Azure's DevTest Labs currently in preview. All Blockchain-related services and partners can now be setup in a lab environment and added as artifacts to the lab as you create it. This exciting development allows for partners and customers to decouple the Blockchain technology from the VM itself and apply these technologies more discretely. Learn more on our documentation page. Want to put your distributed ledger platform or value added service on Azure? Check out the new process of making your services available in the ecosystem. ARM templates: Build an ARM template for the complete one click install of your service to run in Azure. Once completed, your template will show up with other community contributed templates. Use your ARM template to build a DevTest Labs artifact using a subset of your scripts. Find additional documentation on GitHub. Look for the official launch of the Azure Blockchain Marketplace category. This is a more rigorous certification process, so make sure you have a stable release build of your service before you line up. Blockchain and the whole ecosystem is a fast moving space. We look to make Microsoft Azure the absolute best place to develop, test and deploy distributed ledger applications in cloud, hybrid and local environments.